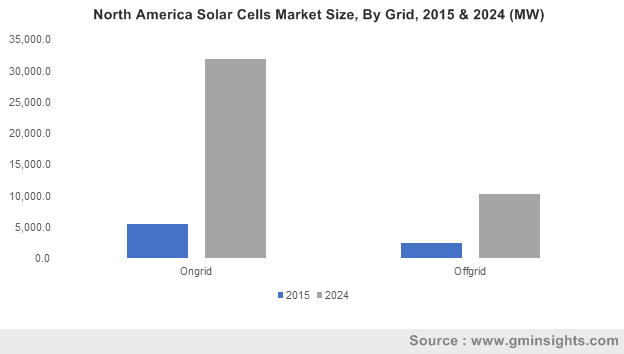 Solar Cells Market size was above USD 66 billion in 2015 with forecast to grow over 12.0% from 2016 to 2024. Government initiatives to promote the adoption of sustainable energy will drive global solar cells market size. Tax benefits, low import duty, financial assistance, subsidy, feed in tariff and net metering are some of the schemes introduced by respective government to promote the industry. Under National Solar Mission (NSM) Government of India, has approved the budget of Rs. 50 billion for implementation of Grid Connected Rooftops systems. This will promote and support the installation of 4.2 GW rooftop systems in the country in coming years. Growing demand for the decentralized generation systems among developing countries will augment the penetration of the renewable energy in future. Globally, more than 1 billion of global population have no or poor access to electricity. Measures toward electrification in off-grid locations will boost the demand for renewable energy in the near term. Growing demand for renewable energy over conventional fuels coupled with government measures toward energy conservation will further compliment global market. Advancement of technology with increasing production capacity has witnessed a decline in overall product system cost which may favor the industry. Crystalline silicon is expected to reach over USD 120 billion by 2024 subject to its of its low cost when compared with other technology. Thin film solar cell segment is set to exceed 81 GW by 2024 subject to its better efficiency when compared with conventional products. Ultra-thin film solar cells segment will grow substantially by 2024 owing to their greater efficiency and light weight as compared to other alternate technology would witness substantial growth over the forecast period. Polycrystalline product segment is expected to witness again over 10% due to its high efficiency and low cost. Flexibility and transparency coupled with growing applications across residential and commercial will propel business growth. Residential application segment was valued over 11 GW in 2015. Increasing adoption of rooftop with growing demand for standalone systems will complement growth. Growing demand for the reliable and clean fuel electricity has encouraged the installation of photovoltaic system in commercial location. Engagement of power purchase agreement with increasing grid parity may further compliment the industry outlook. For Europe, UK will grow at an impressive rate of over 17% during forecast period. Government measured to reduce carbon footprints coupled with target to adopt renewable energy over conventional fuels may positively favor the industry outlook. Government measures towards carbon emission and energy efficiency will drive the U.S. solar cells industry in coming years. South Africa is expected to grow at over 12% to exceed 400 MW by 2024. Growing demand for electricity in the region may favor the business in future. China market was valued over USD 15 Bn in 2015. Photovoltaic industry in the region has witnessed record investment of 80.8 billion yuan in 2015, which will complement the industry outlook. The Government of India has a target to achieve 40 GW of electricity generation from the photovoltaic technology by 2020. Government program and increasing investment toward sustainable energy will drive the market share. Chile was valued at 388 MW in 2015 and is expected to reach over USD 1,400 million by 2024 subject to ongoing execution large scale commercial and utility projects. Solar cells are the electrical devices which convert light energy from sun to electrical energy by photovoltaic effect and are also referred as photovoltaic cells. They are mainly comprised of one or more layer of thin photovoltaic material such as metal, glass, and plastics. The electrical characteristics of the product usually varies from region to region depending upon the concentration of sunlight. Connected assembly of 6×10 cells form a photovoltaic module. The array of photovoltaic system being constituted in such modules generates electricity for commercial and residential applications. These are connected in parallel and series circuit to create and an additional voltage whereas to yield higher current need to get connected in parallel circuits.